Castile soap traditionally is made with 100% Olive oil and with some minor additions this bar is as close as possible. We have all heard how good Olive oil is for you and as a soap there is no exception. This soap is extremely moisturizing to your skin. 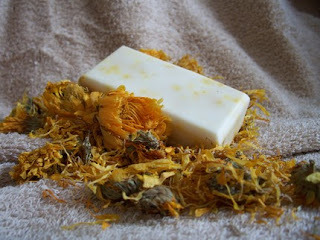 By adding Calendula petals it increases that ability. Now this is where this bar takes an interesting turn. 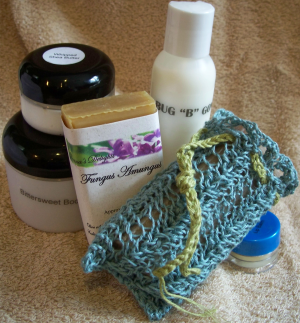 I have added Geranium, Citronella and Peppermint essential oils to this soap. This doesn't just make the soap smell good. When you use this soap and go outside you will have a pleasant bug free time. My best friend lives in New Hampshire. Yes, that's right, black fly heaven. She uses this soap everyday and has no problem with flys at all. In fact her only complaint is that it only lasts about 12 hours. My response to her is that she needs to break out her bottle of Bug "B" Gone lotion that I make.